This is a 3-day spell. You will need to begin by taking a bath in Wealthy Way bath crystals each day. Then anoint yourself on the pulse-points with Wealthy Way oil. Do this each day before beginning the candle-work. Write out your wish paper in green ink, with the success sigils in the corners. Turn your paper and sign your name 3 times over it. Dot the corners with Wealthy Way oil. Dress your first candle with the oil, and set it on the paper. Light your incense, then light your candle, and state your wish. Let the candle and incense burn down. Reserve the leftover wax and ash. Do this each day with a new candle, till all three candles are used. When finished, take all the remaining wax and ash, as well as your paper, and wrap it in gold fabric. Secure it with thread or string, and bury this in your yard. Finally, wash your bedding, and clothes if possible. Either add some more Wealthy Way bath salts to the rinse water, or else when you put the laundry in the dryer you can toss a handful of powder, or a tissue anointed with a few drops of the oil, in to the dryer along with the materials. Nice spell, I always liked Wealthy Way. Also, pretty alter lol. The Kali candle is delightful. I love the altar pic! !I need to start doing some wealthy way work myself, thank you for posting the spell. Great spell, I'd also like to say I really like that pic. I wish more people would show pics of their altars to give us better ideas in creating our own. carolina_dean wrote: Great spell, I'd also like to say I really like that pic. I wish more people would show pics of their altars to give us better ideas in creating our own. Pics of altars is a very personal thing. I would never publicly display my altars. I was actually taught not to take pictures of my altars, because they are private. Again, that was something I was taught and not everyone need follow that concept, but please understand if some folks do follow this advice. I was also taught not to speak of my work while I was working on it. It is fine to discuss past work, but not present or ongoing work. As my mentor often told me "keep it zipped." I have always had both public and private altars. The folks i learned from tended to do work for happiness, protection, and gain in public but to keep difficult work out of sight. I still work that way -- and i love altar pictures. This one, pretty as it is, may confuse newcomers because it does not only show the Wealthy Way spell, but also contains other workings on the same altar. The candle to the Hindu goddess Kali, the bar of Rose-scented Bee and Flower soap, and the scattering of Rose buds are part of anothe r job of work -- and are not specified in the Wealthy Way spell given above. The Wealthy Way work is the yellow paper in the lower right quadrant, isn't it? At least it looks like the $$cc$$ sigil in the corners. the construction of an altar is something that i have enjoyed for many a year. it is slightly confusing to integrate the flavour of theurgy to the method of the spell in a picture when the general focus is hoodoo and the deity associated with the altar is Kali. this is in fact one of the reasons that as a devotee i moved my altar to Kali to another room when commencing strictly hoodoo spellwork and made one for Jesus there instead, upon which i am working candle spells of a more specific hoodoo variety. I have that altar in the North (possibly associated with the Winter Solstice). it is the same table, but contains strictly working tools for the projects/spells that are ongoing. your altar has conflicting energies and portions to it and is therefore arguably not a good demonstration model for the beginner, especially without an explanation included as to where you were doing this spell (on an altar to Kali) and how you were doing it (in amongst your worship or devotion). there's of course no crime in flexing the theurgy in this manner, it just isn't either traditional to hoodoo (which is primarily Baptist and focusses on Jesus or Jehovah or both), or clear to newbies without a detailed explanation (such as that the altar is to an Indian deity and has roses and other devotional offerings to Kali amongst the Wealthy Way spell pieces, which you could describe each in detail for the observer). thanks for showing us the altar. I like 'show and tell' type things and understand that this sort of runs counter-to-the-grain in the realm of magic and, sometimes, religion. the first mojo bag i ever created i carried it on a key-ring outside of my pocket and showed its contents to anyone who wanted to know about it. it wasn't intended as anything traditional. I called it my Power Bag. it had demons and horned nuts and other things in it that people had mixed feelings about. I felt their handling it gave me power to interact socially with them (as i am retiring/shy by nature; the position i was placing myself was far more outgoing and social that to which i had become accustomed). magic is often done privately, and to take it public can be both a liberating and a controversial event. nagasiva wrote: ...magic is often done privately, and to take it public can be both a liberating and a controversial event. This is an interesting post, because I think it highlights an interesting paradox of magic and altars in connection with people. 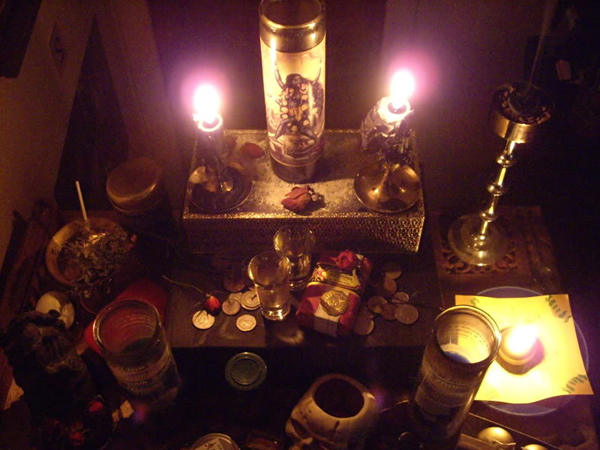 I am quite gregarious and vocal in my day to day life, but when it comes to my personal magic and altars, I am much more private and reticent. Thank you for the post nagasiva. I am trying to work up a spell to bless someone else's career and life. I specifically want to raise up the wish that "Your endeavors shall rain prosperity down upon you and those you work with, like a shower of golden coins." This statement really resonates with me for the situation. Would the crown of success spell kit or the money drawing spell kit be stronger for this? Any other ideas? I am considering adding real miniature golden coins--I can't afford real full-size ones. I have eight mercury dimes, and I could add some of those, if it would be better. I have been saying psalms 86, 87,88 to bring success to others, daily during the waxing moon. I don't think I will be ready by this full moon (2 days away) so I guess I'll have to wait for the next one. pwbvwb wrote: I am trying to work up a spell to bless someone else's career and life. I specifically want to raise up the wish that "Your endeavors shall rain prosperity down upon you and those you work with, like a shower of golden coins." This statement really resonates with me for the situation. Sounds like prosperity to me. I am very intrigued..I am looking forward to becoming an avid customer and student with Lucky Mojo. I very very new to the concept of Hoodoo and ran across this site while searching for similar information on google. Your site is the best one going. My question is this. I am currently unemployed..Need undoubtly to generate some income. So what can I do now,right now to call prosperity to me so that I can have what I need to get what I want? That's a really sweet idea, Sharona. But also, let us be realistic here and note that at $3.00 per pack for herbs and $1.50 per pack for agarbhatti incense from India, spiritual supplies typically cost less than a pack of cigarettes. Your post reminds me of the great qoute "spend some to get some." Even with a little investment you can get a lot. The spell kits are quite economical for what you get and worth every penny. Im doing the "Ritual for Perpetual Ever-Increasing Iincome, Prosperity and Wealth" spell by Rev. Dr. Christos Kioni, Ph.D. that I got from LM spells. The instruction say you have to start this spells in New Moon to Full moon. Can I just it start doing it on waxing moon? and on what day? If I start New moon, do I have to perform this spells for 15 days? When a spell says something specific about timing, I try to follow it. In this case you are working from the new moon to the full to get the energetic punch of a full cycle of waxing moons -- which are appropriate for building and drawing things to you. I would stick with the timing on it and if for some reason that is not possible I would look for a different spell. Thank you very much. Your always good! I went to LM and put everything i needed in the basket for the total (including shipping). I wrote the total on a piece of plain white paper and folded it towards me twice. I put the little piece of paper with the LM order under a tea light and lit the candle asking for the doors of prosperity to open up to me. Just do one tea light a day until the money comes. Because you don't have herbs and oils, this will be a very weak spell. Instead of one lump sum, it will trickle in little by little. ie you find two quarters or someone insists on paying for your lunch even though you have cash in hand. What you have to remember is save the extra money that comes your way, until you get it all. Also, when you have limited funds, your first instinct might be to order prosperity products. Don't. Cleans yourself first (LM 13 Herb bath). Next protect yourself (Fiery Wall of Protection Oil). THEN ensure your prosperity (crown of success spell kit). This is a good reference website. I will do as everyone has suggested. I've been hearing from many people lately who are really hurting financially in this economy. It seems that everyone is getting bailed out except for the common wo/man. The one thing that surprises me is that many of the people I am hearing from come from magickal traditions, and identify as Wiccans, Magicians, Rootworkers, etc....As magickal practitioners, you would think that they would have been doing some type of ongoing prosperity work so that they would not get behind in their bills, and have enough money to pursue their interests. So with that in mind, here are some easy low-cost money drawing spells that you can perform to help bring prosperity and increase into your life. Burn the skin of a red onion to draw luck and prosperity into your home. Lore dictates that the onion should be stolen to do you any good, but it never hurts to do this with one you've paid for. Print the Second Pentacle of Jupiter out on your computer. Write your name on its reverse three times, then cross and cover this with the word Prosperity. Finally, write the statement Money Come to Me, over and over around this forming a perfect circle. Blow a little powdered sugar (known to some as Drawing Powder) over the talisman, fold it towards yourself three times and keep this in your wallet or purse to draw money and peace of mind. If you desire you can make a second talisman is this manner and keep it in your check register. If you don't have drawing powder, again, use cinnamon powder. Directions: Perform this working when the moon is New. Break off a few pieces of the cinnamon stick and place this in the dram bottle, add some cinnamon powder, then fill the bottle with olive oil. As you prepare the oil, pray over the oil saying something such as Heavenly Father, may your power work through this oil to crush the mountains that block my path and set my feet on the path to prosperity, may it increase the fruit of my good work, bring about wealth and bless it. In Jesus' name. Amen"
On a piece of brown paper torn on all four sides by hand, write your own name three times, then cross and cover this with the words "Prosperity is Mine!" Anoint the four corners and center of the paper with oil, then fold the paper towards you three times, turning it clockwise between each fold and then set the paper aside for now. Spread out the sand (or dirt) in the Pyrex dish so that it is approximately 1/4 of the way full and level. Place your petition paper under the Pyrex dish and arrange the 14 tea lights in the dish. Remove the tea light from it's little tin cup and carve the words prosperity around the candle. Put nine drops of the cinnamon oil in the bottom of the tin cup and replace the candle. Do this for all 14 candles. Light the first candle and incense then focusing on your desire, pray from the heart for prosperity and increase in your life. Alternately, you can pray the 23rd Psalm. Let the candle burn out on it's own. The following night and each night thereafter as the moon grows, burn one of the tea lights and repeat your prayer; burning your last candle on the first night of the full moon (which will be about 14 days). When the moon is New again, repeat your ritual. Note: All of the materials called for in this spell can be obtained with reasonable cost. A 50 count bag of tea lights can be purchased fairly cheap for as little as $2.50. Many people already have cinnamon in their spice rack and olive oil (or some kind of vegetable oil) in their pantry. If you don't have cinnamon yourself, surely you can borrow some from a neighbor. If you don't have or don't wish to use the Pyrex dish, you can prepare one candle each night and burn it on an overturned saucer. In addition, you can use dirt from the grave of a rich man in place of the sand, or dirt from a thriving business or a bank, or uncooked rice. To perform this spell you will have to begin by taking a trip to a business which is known to be successful and consistently turns a profit. This can include a bank, a grocery, or even a franchise in a national chain of businesses. Take a dollar bill to the place that you choose and ask the cashier for 10 dimes. Now before you leave the establishment, you must leave one of the dimes behind somewhere. When I performed this spell, I walked outside and pushed the dime into the ground outside the business. When you are ready to perform your spell, take the nine dimes and arrange them so that they form an equal armed cross. Take a piece of paper and write your name on it nine times, then cross and cover this with the affirmation Prosperity is mine and draw dollar signs in the four corners. Anoint the four corners and center of the paper with your cinnamon oil. Fold the paper towards you three times, rotating it clockwise between each fold. Place one candle in each of the four "corners" that formed by the dimes and in the center place the petition paper. Anoint the four candles with your cinnamon oil. Take a cinnamon stick, a ginger root, and one whole nutmeg and anoint them with your oil as well then place them on top of the petition in the center of the cross of dimes. Light the four candles and make your prayer or petition for money and prosperity. When the candles have burned out, collect the nine dimes, the petition, the Cinnamon Stick, Ginger Root and Whole Nutmeg and place this all in a green mojo bag. Anoint the bag with money drawing oil as well. Many spiritual practitioners believe that to receive, one must give. For this reason they will often sacrifice a certain amount of their own money by donating it to a random stranger (usually someone who appears to be in dire need), or a worthy cause. This is done without any expectation of receiving anything in return, but given freely with the knowledge that as you bless others, so will you be blessed yourself. Some people have a tendency to believe that when it comes to money magick that it is a once and done thing. They will do their working, have an initial success and then believing that the money will continue coming in they don't continue their efforts. It is important to remember to continue your work even in the good times so that your money luck doesn't dry up. These workings were designed to be fairly easy to perform with materials that can be obtained with little effort at a reasonable cost, even for the individual who is on a tight budget. When you begin to reap the rewards of your efforts you may wish to invest in a wider array of supplies, materials, and/or curios that are more traditional and which can all be purchased through Lucky Mojo. However, I would caution you not to rely on magick alone to bring about prosperity and increase in your life. Let your magick work in tandem with making wise choices when it concerns your money. Those are excellent suggestions, thank you for posting them. I would also like to add that an oil lamp for money drawing works very well in the long term, the continued cost only being the oil. I like the Money Stay With Me spells and ongoing money work. Just like protection, money work must be continuous. Also, any job work should be ongoing and a honey jar on the boss. I don't know how y'all feel, but I get so disappointed in practitioners from magical traditions, when the whine and gripe about how bad their lives are and then don't put their knowledge into actual practice in order to improve their lives. I understand that there are times when people need to vent, but when that time is over you need to stop thinking about all the excuses for why you can't do a thing and start focusing on what you can do in the here and now to improve your life. Also, on the original subject of this post, I wanted to add that you should never discount the simple act of prayer alone. This is not only true of money magic, but of any problem or goal that you have in life. Best of all it won't cost you a dime! I'm new at this and I wanted to know what products would I use (either separately or in conjunction) to DRAMATICALLY increase my income and luck. I need to know what to use first for the preliminaries(as in to 'open the door' for the good opportunities to start coming my way) and then what products to use to gain dramatic luck and wealth. Oh, and how to use the products (think voodoo for dummies because I'm a dummy) would help too especially concerning oils, (where to dab them and what to say/do before or while dabbing them on to my skin, clothes..etc) perfume, baths, and incense. Well first off I'll list the products you might use for luck and money. Sorry for the hoodoo/voodoo mix up, and aren't I supposed to do something first before I begin using these products? And has anyone had any results from using these products? Sorry missed this part I would suggest a cleansing bath before any work. The 13 herb bath is a very good choice to cleanse yourself of any bad luck and the 7 herb bath is great for drawing in good luck. I would do the 13 herb bath first. You should do the Uncrossing Spell kit first to clean yourself up. Also, think about Money Stay with Me, because keeping money is harder than getting it. If you play bingo, Lucky 13 works for that. You can also get a lucky hand mojo. if you are a gambler. Sounds like you want easy money and not money attached to working. If you have a business, you would go with prosperity products. If you want easy money, wealthy Way products are in your line. Attract Money products are good for both. Van Van and Fast Luck will quicken your luck. So far I hadnt had much luck with the money drawing and fast luck kit either....did i do something wrong? Mabel did you try doing a cleansing such as the ones suggested to me before trying any of the work? And did you follow the instructions to the letter and BELIEVE in it to work? The success sigil mentioned can be found here : http://www.luckymojo.com/moneydrawing.html. As for what to do if you have limited space, try a temporary alter, its only an alter when you use it for work after that you put the stuff away and it gos back to being your nightstand or dresser or coffee table. I always use a green candle on a Friday,which is the day of Venus in the hour of Venus. I use patchouli leaf, dill weed, five finger grass, and lately fenugreek. But i just rub down the green candle with the money drawing oil, dress it with the appropriate herbs,roots, and wait for the proper hour and then light it and let it burn all the way down. If the glass breaks, I get my wish. I did this with her lovers oil and used a red candle and the appropriate herbs and it broke the glass, then i tried it again the next night, and darned if it didn't break the second glass! Another good way to start getting prosperity to come to you is to give something away with no expectations of reimbursement by that person. Charity is a powerful thing. It doesn't have to be much. A friend of mine would tape a dollar bill to the inside of the stall door in the woman's bathroom with a note wishing the person that found it all the luck in the world. She does it once a month and has never worried about money. I have a question about the money talisman, when you cross your name, which is written 3 times, with the word Prosperity, which is only once, are you to turn the paper clockwise and write on top of your name? SOrry kind of confused as to how it will look. Both your name AND the words prosperity is supposed to be written three times. There's actually a picture later in the original post that shows how a petition should look. You don't fold the paper until after the petition is written. Having come from many years of pagan practise prior to arriving here I can clarify a couple of things regarding some of these ideas posted here about how pagans can't seem to do prosperity work for themselves. It does seem rather common, and I think in part its lack of self esteem, and lack of faith in the universe/gods etc. These are my opinions only, and I am not saying this applies to all pagans in any way, but I have noticed in my own works when I was up i was really up, my prosperity work was amazing. However as time went on, as my self esteem waned, and the more I heard about how materialism was bad, the less my prosperity efforts worked. I am not saying they wouldn't work at all, I turned it around a couple of years ago, got myself a great job, etc. But things fell apart again this time for health reasons. This time I am older and realize its not my "prosperity" work that's failing, there's alot more going on, and I am gonna get it all straight again in time. Materialism is sorta a dual edge sword in paganism, you care less about the hottest trend, the "fitting in with the jones's" etc and yet your drawn to the pretty trappings of paganism etc. So while many pagans don't seem to fall for the need for the hottest trends, clothes, technology, etc. some spend what little extra monies they do have on rocks, and glitter, and nifty little chachkis. So like most people they are living paycheck to paycheck, and when the unexpected happens they are just as strapped as anyone else. At least in my case my lack of self esteem would prevent me from either using my magic (thinking I didn't deserve more, or whatever) OR maybe its just to little to late, and lack of immediate results creates doubt, and depression. We are after all a society that demands immediate gratification. I have run into this problem not only with myself but with other members of my own family, in mundane as well as magical endeavors. Lack of enthusiasm, follow through, etc. In a word, LAZYNESS is what it boils down to (remember im talking about me and my family now not pagans in general). Its a viscous circle, with less effort offered in half hearted attempts over time until finally your just going through the motions, skipping steps, etc. I am realizing alot of this just now, reading over all of this massive material I have now from cat's course book, and the online resources here. It isnt that it never worked, its lack of commitment, effort, follow through, etc on MY part that is a big part of the problem. And btw I am creating a prosperity alter now and I will be attaining the financial stability I need and deserve. That being said, thank you Dean and others for posting ideas and options here (and elsewhere) on the forums for making this happen. You are marhvelous! Good luck in all your work Willa. The story by Turnsteel reminds me of my own great grandmother, a woman who came to this country with 4 young children...very poor...spoke no English. Her village took up a collection for her boat passage...to see if her presence would 'cure' her dying husband who came earlier to this country to provide for her in the old country. Well he was on his deathbed when she arrived and died shortly after, leaving her virtually penniless. Returning from his funeral, She gave away the last few coins that were left in her purse to the poor, proclaiming 'now I have nothing, I am in God's hands He will take care of me'. And He did. Not that she became a rich woman, but she worked hard, as a midwife, wet nurse and herbalist, never losing her dignity, and raised her 4 children to be successful adults and was able to have a comfortable old age. None of this was done with welfare or public assistance. Somehow that gesture of giving away the last few coins in her purse, surrendering herself to the Higher Forces was pivotal in her survival. I never knew my great grandmother; but I wish I did; the herbalist part particularly intrigues me, but all that knowledge was quickly swept under the rug so to speak, by her grown up children as being well, I guess 'old country' or something like that. That is one way to do it. There are dozens of different ways to write out talismanic seals and petition papers. I think it would be very inexpensive to keep the money drawing oil lamp burning. They are only $7 and are dressed at LMCC for money drawing to your home. heathernijoli wrote: I think it would be very inexpensive to keep the money drawing oil lamp burning. They are only $7 and are dressed at LMCC for money drawing to your home. I agree with this Heather. I started a money burning lamp for my business and it has added a very nice and strong punch to the other work that I am doing, so I am definitely a lamp lover now! Can the following lodestone money spell began even as it is the full moon and waning will begin in 3 days? jwmcclin wrote: Can the following lodestone money spell began even as it is the full moon and waning will begin in 3 days? Not everyone follows moon phases is doing their work, especially if the need for the work is urgent. So, yes, you can start a lodestone money-drawing spell in the timeframe you describe--though Sunday,Monday, Thursday, and Friday are likely to be the best days for such work, based on the planetary rulerships of each day. That said, if you do decide to follow moon phases in planning your money work, you can work all phases of the moon by working to reduce debts and financial obligations during the waning phase of the moon, and working to increase income and draw in money during the waxing phase. It does, I read somewhere that some had a continuous oil lamp money spell...how does that work...what are the steps to step it up? jwmcclin wrote: It does, I read somewhere that some had a continuous oil lamp money spell...how does that work...what are the steps to step it up? Several workers that I know have money lamps going. You fix them in a very similar way to how you fix a vigil light. The well of the lamp can be filled with appropriate herbs, small amounts of condition oil, and curios then filled with lamp oil. For added effect you can dye the lamp oil green. A permanent petition may be included in the well of the lamp and temporary peitions can be placed under the lamp. You would pray over the lamp just as you would a money drawing or money stay with me light. Can anyone tell me their experience for an wealth spell using only herbs and the psalms? that had a positive outcome Anyone? how did you implore this to work to your advantage? Anyone? This isn't really the kind of forum where folks post their experiences. It's a product forum for how to use Lucky Mojo products. Good luck with your work, and i hope you gain enough confidence to not have to seek validation from others when using prayers.